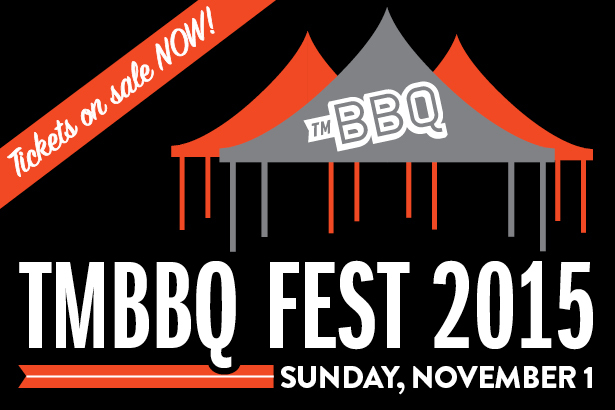 Every year, we invite the restaurants on our Top 50 BBQ Joints list to the TMBBQ Fest, an event like none other. Sample from the best purveyors of smoked meats the state has to offer , and enjoy a day of great music, cold beer, and fascinating barbecue shop talk. Tom – Regular contributor to this blog and author of this review. Scott – Regularly makes trips with Tom. Provides much needed snark. It was also his birthday present. Sherrie – Tom’s boss. Her area at work got her two tickets for Boss’s Day. Tom also regularly bribes her with BBQ in hopes of a pay raise. It hasn’t worked yet. Tina – Another person who works with Tom and Sherrie. She doesn’t eat beef, so was there for ribs and poultry. She did not submit a score sheet. We arrived at various times, but were all together and inside about 1:15pm. One clever thing they did was put the festival map on the back of fans, making finding places easy and comfortable. Sherrie and Tina had staked out a table and we went on various runs bringing back samples. We ended up trying about 11 places (which ones varies as Sherrie and Tina had made a run before we got in, and they left before we did). *Most of the tastings were actually pretty substantial. Two people could get a pretty good taste off of them. Next time we’ll get one from each place for two people, which allows room for more food. By the time we’d reached tasting number 10, we’d started filling up. *We may also start learning to eat in line. We spent huge amounts of time waiting in line and carrying samples back to the table (although we’d get two or three on each run). If you taste one while waiting in line for the next, you save a ton of time. Places tried: We did try a wide variety of places (between 9-11 per reviewer). For the most part they were all places we hadn’t tried before. Tom and Tish: Cousin’s, Cranky Frank’s, Franklin, Freedmen’s, Hutchins, Lamberts, Lockhart Smokehouse, Miller’s, Pody’s, Two Brother’s, Tyler’s. Scott: Cousin’s, Cranky Frank’s, Franklin, Freedmen’s, Hutchins, Killen’s, Lockhart Smokehouse, Miller’s, Pody’s, Two Brother’s. Sherrie: Cooper’s, Cousins, Franklin, Freedmen’s, Hutchins, Lamberts, Louie Mueller, Miller’s. Two Brother’s. Disclaimers: Not everything from every place was tried/rated. We also know that this is not necessarily going to be an accurate representation of how the food normally is. We’re not using this as a benchmark for whether a place is worth visiting or not. Poultry: There were only two poultry items we tried. Two Brothers had chicken and Miller’s had turkey. Pork Loin and Pulled Pork: We were able to try either pork loin or pulled pork from the following places: Coopers, Cousins, Franklin, and Lamberts. Pork Ribs: The places we ended up trying ribs from were Two Brothers and Killen’s. Two Brothers had a cherry glazed rib. The flavor was excellent, but is was somewhat tough. Tish really liked hers despite the toughness and gives it an 8.5. Scott and I give it a 6 because of the toughness. Avg: 6.8. Sausage: There was lots of sausage to try, with most places doing some form of spicy sausage. Read on though, because two of the more interesting things of the festival happened in the sausage category. Note: I (Tom) don’t like jalapeño. I like heat just fine (Sherrie has seen me eat ghost pepper salsa), but I don’t like the taste of jalapeños. As a rule, assume that my score is probably 2 points lower than it would be for someone who likes jalapeño. We had sausage from: Cousin's, Franklin, Freedmen’s x2, Hutchins, Lamberts, Louie Mueller’s, and Miller’s. Louie Mueller’s: Sherrie is the only person who scored here, giving it a 3. Franklin: I did Franklin out of order because they were the source of probably the biggest surprise of the day. Apparently they started a new sausage recipe 10 days before the festival (I asked). The results are … mixed. First the positives. I think we all agreed that the sausage was well smoked. It had good texture, snap, and was nice and juicy. They gave large enough pieces that you could really get the characteristics. However, where it lacked was the flavor department. There was definitely uncertainty as to how much we liked it. Tish thinks they are using whole pickling spice as a seasoning. As for me… Well, I had two pieces that seem to have been from the end of different links. On each of these pieces, the very first taste I noted was a strong flavor of cigarette smoke. I honestly had flashbacks to my college when I used to date a smoker. In short, while I noticed a strong smoke flavor, it was not a good flavor, and it colored the rest of the flavors for me. Brisket: And finally, the king of Texas BBQ. When you talk Texas BBQ you are talking brisket first and foremost. In fact, it was a very bold move of Two Brothers to not serve it (and they were the only place we tried that didn’t have brisket). Cousin's: Cousin's turned out a nice solid product with solid flavor and decent bark. It was moist and tender. Scores: 6 (Tish), 7 (Sherrie, Scott, Tom). Avg: 6.75. Cranky Frank’s: Cranky Frank’s may be better than scores are going to show because someone messed up. Scott and Tish really liked their pieces, and found them tender with a nice bark and good flavor. Unfortunately, what I got was a large piece of nothing but fat with no meat at all. Since you get rated on what you serve, it was flavorful fat, but fat nevertheless. Scores: 5 (Tom), 8 (Scott and Tish). Avg: 7. Franklin: As to be expected Franklin turned out their usual excellent product that was moist, tender, and had a good bark. As with most of the top tier joints, it’s always about flavor and they do an excellent job even with their lean (they were sampling both moist and lean). Scores: 8 (Tish), 9 (Scott and Tom), 10 (Sherrie). Avg: 9. Killen’s: Tish and I were the only ones who tried their brisket. It was reasonably tender and moist, with a decent bark and good flavor. Scores: 7 (Tom and Tish). Avg: 7. Louie Mueller’s: Sherrie is the only one to score their brisket, giving it a 6. Avg: 6. Pody’s: Pody’s was a solid entry, the bark was a little weak but it had a very nice smokiness. My piece was a touch dry. Scores: 6 (Tish), 6.5 (Tom), 7 (Scott). With all of that done, what would be our recommendations of the places we’ve tried? Well, Franklin (Austin, TX) is an obvious choice. It won two categories pretty solidly. Also, while you hear about the lines there, it’s a unique social opportunity that is worth experiencing at least once. Hutchins (McKinney, TX) also gave a very strong performance. If you average our scores for each product they presented, Hutchins (8.06) actually beat Franklin (7.68). That bears close scrutiny. Next time we visit Tish’s folks we may have to make a day trip to McKinney. Scott is very excited about Two Brothers (San Antonio, TX). It’s not far from his folk’s house, and the cherry glazed rib did taste wonderful. And finally, Miller’s (Belton, TX) and Freedmen’s (Austin, TX). It’s good to see they are both willing to take chances with some unusual sausage combinations. They seem worth checking out on that basis alone.